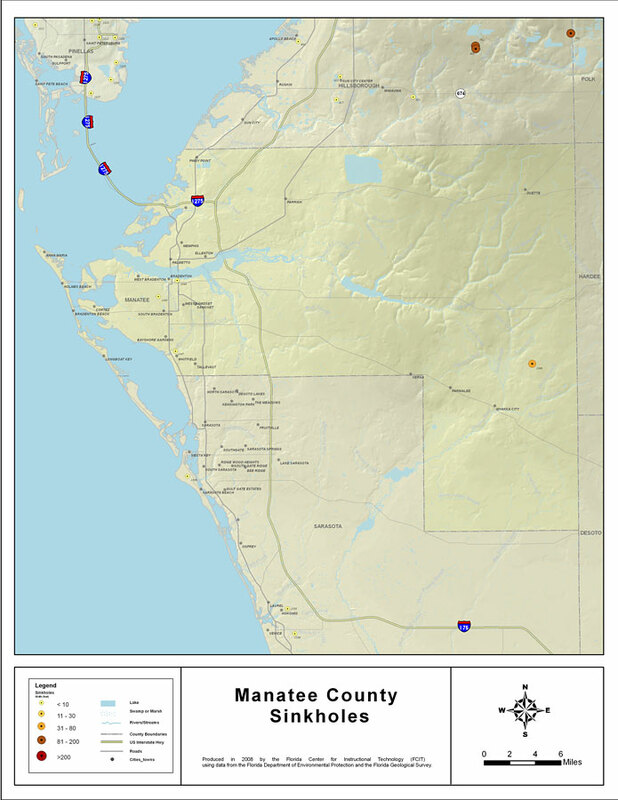 Description: This map was created by FCIT and represents reported sinkhole events in Manatee County based on data gathered by the Florida Geological Survey (FGS) and the Florida Department of Environmental Protection (FDEP). " This dataset represents a set of points for reported sinkhole events. The data herein represents reported sinkhole activity but may also contain non-karst related subsidence such as collapsed septic systems, water mains, and/or other man-made features. This information contained in this dataset is primarily used to more fully understand the unique relationship between karst and the state's groundwater resources and aquifer systems." DATA DISCLAIMER This geologic data was developed to carry out agency responsibilities related to management, protection, and development of Florida's natural resources. Neither FDEP/FGS or the Florida Center for Instructional Technology assumes any responsibility for the consequences of inappropriate uses or interpretations of the data. For a complete list of sinkholes in this county, click here.